Charming, modern, clean and fresh, quiet two bedroom single storey cottage built circa 1840 situated on the edge of Epping Forest and next door to a secure Children's Playground. Less then a minute's walk in the other direction takes you to Queens Road which has the quaint village feel with an array of cafes, restaurants and boutiques along with Waitrose and Costa Coffee. Buckhurst Hill Station (Central Line Zone 5) is under a 5 min walk away and will have you in Central London in 20 minutes. The modern kitchen with granite surfaces is extremely well equipped with everything you should need along with an integrated fridge/freezer and dishwasher. There is also a washing machine and microwave for use. Master bedroom (king size bed) has beautiful French doors which lead you into the south facing ivy clad courtyard with Weber BBQ. The second bedroom has two comfortable single beds. Family bathroom contains a bath and a separate large shower to enjoy. Parking outside the property is residents only so there is always plenty of space and a visitors parking permit will be provided for your stay should you require one. 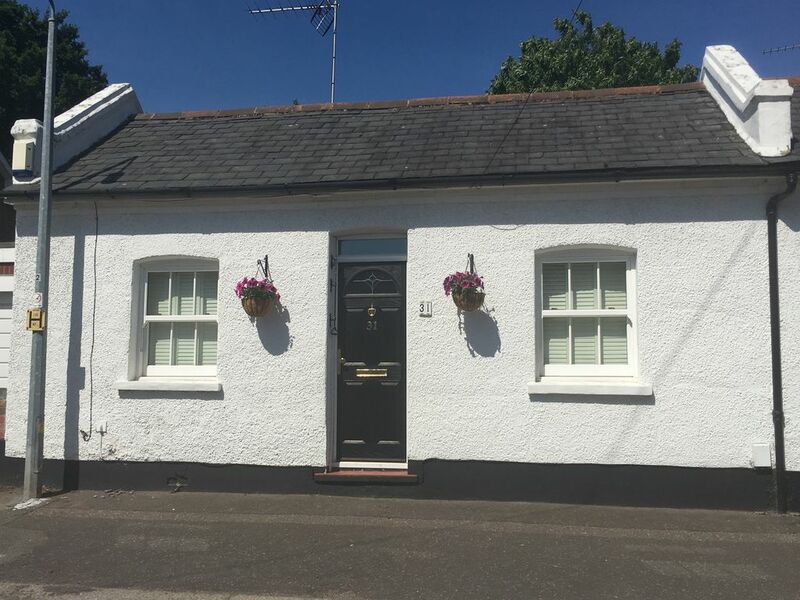 A well appointed and located cottage. The cottage is in an excellant location, well equipped and very well maintained. Kirsty's weclcome was warm and generous - nothing was too much trouble. It is ideally located with easy access to central London or walks in the forest. The proximity of shops is a bonus. Three of us recently stayed at this adorable little cottage in Buckhurst Hill. The home was clean, well equipped with amenities, it smelled amazing, and we couldn't ask for anything more. Buckhurst Hill is outside the city of London but a very easy trip on the tube to get into central London. The tube station is a short walk from the cottage. There is a park behind the cottage and a great restaurant/bar literally feet from your doorstep. There is also a market for groceries very close by. After a long flight from New York to London, Kirsty the owner, kept in great contact with us to arrange our arrival. She is a lovely woman and I hope we remain in touch. London was a stop on this trip as part of my 40th birthday and Kirsty went over the top to remember that bit of information only given to her at the beginning of our communication. Definitely the best host I've had the pleasure of meeting this far. If you are looking to visit London but want to get away from the hustle & bustle I highly recommend this home. If we ever come back to the UK, I would stay here again no question. Made to feel really welcome by the owner Kirsty on arrival. The cottage had a cosy friendly feel and was immaculate with all modern amenities and the back courtyard was lovely. It was an ideal location, close to a lovely pub with excellent food and welcoming to children. Lovely shops and high street 2 minutes away and 5 minutes to the tube station. We loved our stay and our daughter is counting down the days for our return. Thanks to Kirsty and Tom for a great experience. WOW WOW WOW! from receiving the keys, to looking around to spending the weekend just wonderful, I can honestly say i could not have asked for more. Just a Beautiful warm lovely Cottage Dont know why i had never booked a home from home before now. The cottage was bigger than I expected. Very clean and the beds were very comfortable. In a great location just a tube ride to London attractions. Kirsty was very welcoming and helpful all the way through our stay. We spent 2 nights and didn't want to leave. The cottage has everything that you would need and really is a home from home.